Reyonlds's Distance Map of London with the Recent Improvements. 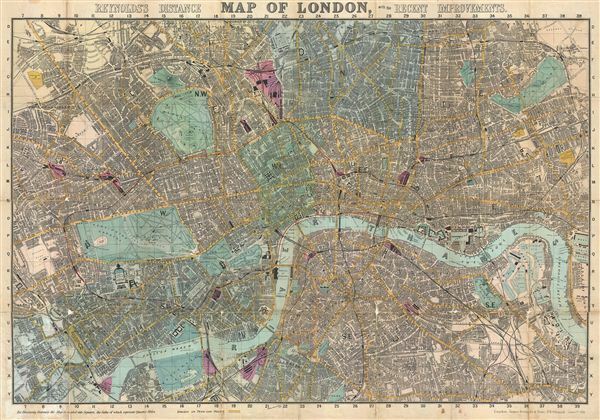 An attractive example of the 1891 issue of Reynolds' 'Distance map of London,' alternately titled the 'Shilling Coloured Map of London.' Centered on the Thames River, this map covers London from Highbury to the West India Docks and from Peckham to West Kensington. It is divided into quarter mile squares. The map shows all omnibus and train routes as well as streets, parks, government buildings, rail stations, palaces, and churches. Hand colored in red and green pastels. This was one of the popular pocket maps of London. Reynolds first issued this map in 1857 and it was updated annually to 1901, by which time Charles Smith and Sons had taken over the Reynolds firm. Good. Wear on original fold lines. Professionally flattened and backed with archival tissue.